You know we're close to Election Day when Sam Katz is getting his own blog. His will launch Monday at PhillyMag.com. Bring it on, Sam. Bring it on. Another week down, only six to go between now and Election Day — aka, the day Sam and I are out of jobs as bloggers. Another week down, only six to go for the heat to get turned up. It's already starting to happen, what with Michael Nutter's anti-John Street ads, Bob Brady and Tom Knox's verbal scrapping, and Dan U-A forced to jump in the middle of the discourse deevolution at Young Philly Politics. "Your mom," says Tom Knox spokesperson Susan Madrak. "No, your mom," says Councilman Jim Kenney. And Donna Reed Miller keeps a horse in her backyard. Wha? Couldn't close out the week without mentioning that. 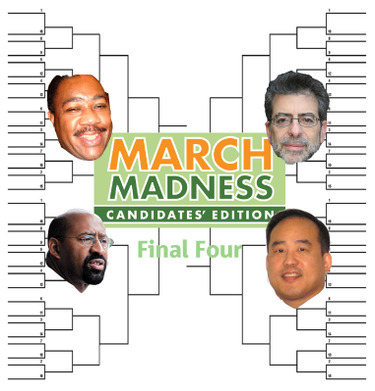 Remember to place your votes for the March Madness Final Four. Goode vs. Oh; Nutter vs. Ackelsberg. And then watch some real basketball; unless you're like me and accidentally bought tickets for a documentary Saturday night that starts just as Florida and UCLA tip off. UPDATE: Brady's lawyers are asking that Knox's appeal be heard by the Supreme Court, rather than Commonwealth Court, to speed up the process. Make sure to read Brian X. McCrone's look at the effect of school budget cuts on security. His front page piece today examines the situation at Vare Middle School, one of the "persistently dangerous" schools in the city. Vare is losing population and funding for security, according to a preliminary budget. Meanwhile, the school district's police force has lost 135 officers over the last four years, said school police union chief Mike Lodise. School police officers have been assaulted by students 265 times during the current school year, Lodise said, while teachers have been assaulted 637 times as of [Thursday]." Vare's principal, Ennis Manns, just returned after an assault by a student kept him out of work for a month. "We might see the fountain spray on...but...all we need is Love." Got lost for a moment at whether I was watching Michael Nutter's arts and culture policy plan rollout or a Queena Bass press conference this afternoon at LOVE park. That line pretty much sums up Bass' speech at the Next Great City initiative forum last month. Meanwhile, while Bass fights the forces of evil threatening to shut off her water and evict her from her apartment, Nutter became the fourth candidate to unveil an arts and culture plan. Like the rest, he would reestablish the shuttered office of arts and culture (shouldn't cost much as most of the workers were sent elsewhere, he said) and pledge to increase the city's share of the Cultural Fund by $1 million in his first year. He wants to raise its operating budget to at least $6 million in four years. He would also seek to increase funding for the Greater Philadelphia Film Office and assist arts and cultural organizations in the region. The NBC10 contract excuse is no longer available to him, but Chaka Fattah continues to withold his tax information. He's the only candidate not to accept the request of reporters from the White Tower to give up recent tax filings. Renee Chenault-Fattah, an NBC10 anchorwoman, said yesterday that the television station had waived the contract restrictions that barred her from disclosing her salary. But she still wants to keep her salary private. Fattah, the only one of the five major Democrats in Philadelphia's May 15 mayoral primary to decline to release his income tax returns, said Wednesday that disclosing the couple's joint income would violate the confidentiality agreement. Yesterday, he said he would comply with his wife's desire for privacy. How he got to Final Four: The No. 2-seed in the Roosevelt Boulevard bracket, he defeated Republican at-large Council candidate Gary Grisafi, incumbent at-large Republican Councilman Jack Kelly, Democratic at-large candidate Bill Green and Democratic at-large candidate Matt Ruben. Why you should vote for him: Nutter is the lone mayoral candidate to make the Final Four. He’s been called a champion of ethics reform from his days on Council and is responsible for the smoking ban, which is a reason not to vote for him for some. In the real election: Running for eighth district Council seat. Experience: Activist for low-income Philadelphians, former head of Community Legal Services. How he got to Final Four: The No. 9-seed in the Ben Franklin Parkway bracket, he defeated Democratic Council candidate Cecil Hankins, Democratic mayoral candidate Bob Brady, Democratic Councilwoman Joan Krajewski and Democratic Council candidate Curtis Jones Jr. In the real election: Running for at-large Democratic Councilman. Experience: Two terms on City Council. How he got to Final Four: The No. 3-seed in the Columbus Boulevard bracket, he defeated Democratic Council candidates John Longacre, Marnie Aument-Loughrey, Frank DiCicco and Daniel Savage. In the real election: Running for at-large Republican Councilman. How he got to Final Four: The No. 9-seed in the Germantown Avenue bracket, he defeated Democratic Council candidate Cindy Bass, Democratic mayoral candidate Dwight Evans, Republican Councilman Frank Rizzo, and Independent wannabe mayoral candidate Larry West. Why you should vote for him: “I think I’d make a good Councilperson because I believe I am pushing for the legislation that reflects what many Philadelphians want,” Oh said. He said he would focus on improving large economic engines, like shipping, for the city to become part of the global economy. Dwight Evans will release his arts and culture policy paper this afternoon in front of the grand mural on the wall of a building at Broad and Spring Garden streets. Helping the city's world-famous Mural Arts Program will be a big part of his plan, he says. Evans would also seek to reestablish the office of arts and culture, reinstate the mayor's arts and culture council, and push for a voter referendum to establish a new sustainable revenue stream for arts. Evans says the city only contributes 3 percent of the arts and culture industry's revenue, compared to Denver which provides 9 percent and NYC which provides 10 percent. He would also work on creating public/private partnersships to enhance arts funding and promote the expansion of local cutlural organizations. He also wants to offer students greater exposure to arts education. Expect more talk of Evans' "Hollywood of the East" plan as well. Sorry I'm late: Just saw some great election-year politics democracy in action at City Hall as City Council voted unanimously to overturn Mayor Street's veto of the anti-casino referendum. Barring any unforseen setbacks, voters will have a chance May 15 to decide if they want casinos within 1,500 feet of neighborhoods, schools, churches, playgrounds, etc. Then it will go to the courts ... and maybe the voice of the people will wind up meaning nothing. So it goes. Turns out Fattah's excuse that he couldn't release his taxes because of wife Renee Chenault-Fattah's NBC10 contract was legit. Meanwhile, Fattah and Dwight Evans are both pushing for all of the city's middle and high school students to be able to read this blog on their very own laptop. So thoughtful to think of me, fellas. UPDATE: City Paper's Tom Namako nails the scene outside of Council chambers after the veto override. The hallway looked ready at any minute to explode into a union vs. anti-casino activist throwdown. Mayorpalooza reports that Round 2 is officially underway. Even though Tom Knox's attorney, Paul Rosen, is vacationing in St. Bart's, an appeal has been filed against Judge Patrick J. Toole's decision to allow Bob Brady to stay on the ballot, according to Mayorpalooza. KYW has the post-Round 1 back and forth from Brady and Knox. "I don't mind people calling me names. I'm a pretty big boy. I'm a little upset that he would insult working men and women -- unions." "I don't think working families are insulted when you fight for the same rules for everyone. What we're seeing here is big boss politics." "I'm going to do that [working on the issues]. I'm not going to sit in court filing my nails." "I wasn't sitting there for six hours filing my nails. If I were, I wouldn't have any." Seeing how the press release to announce this morning's Bob Brady "Housing Opportunities" press conference came as part of the release about yesterday's court decision, it completely fell off my radar. (One-track mind, sorry). According to Brady's "Housing Opportunities for Everyone" policy plan, he would seek to create a deputy mayor of housing and neighborhood preservation, create a housing trust fund from unclaimed Sheriff's sale proceeds and ugrade the basic systems repair program. "When people are unable to maintain the homes that they own, inevitably the end result is homelessness and urban decay," Brady said in a release. Other details of the plan include pushing for inclusionary zoning legislation to set aside 10 percent of new developments for affordable housing. Looking back through the campaign, fellow congressman/candidate Chaka Fattah also proposed expanding the basic systems repair program and increase funding for the housing trust fund. Also, Michael Nutter proposed increasing funding for the trust fund to work on home repairs. His plan also tackled the 10-year tax abatement.